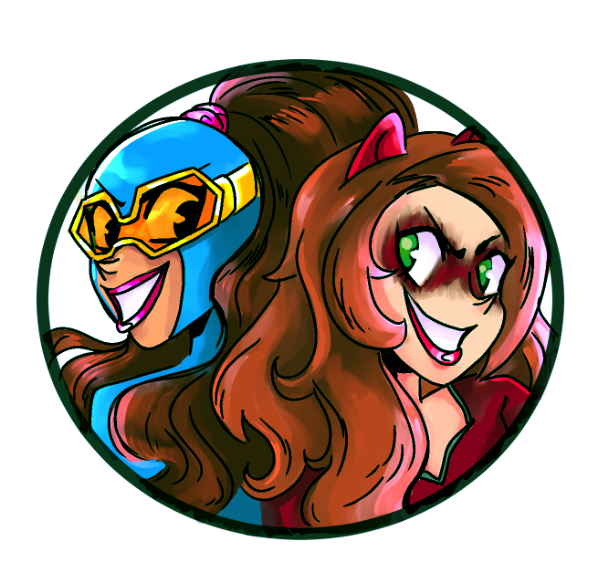 ← Check Out Hawk and Dove! Happy Star Wars weekend, everybody! Have you seen The Last Jedi yet? That seems to be the big how-do-you-do around here. I saw it a couple nights ago and enjoyed it, though I have plenty of reservations and nitpicks. I’ll share everything on Wednesday! For now, how about some enjoyable comics? A lot of my favorites came out this week, from Detective Comics to Unbeatable Squirrel Girl! But, and kind of against my better judgement, I’m going to give Comic Book of the Week to Mister Miracle #5. This comic is such a mind-blower! But damn if it doesn’t get me thinking and enjoying good comics. I missed reviews last week because I was out-of-state on an awesome vacation. And it’s a real shame, because there were some excellent issues of some of my favorite comics! Both Hawkeye and Iceman were great, as usual, but holy cow, I missed a great issue of Batman! I thought the last few issues starring Catwoman were already amazing, but Tom King’s take on Batman and Superman was mind-blowingly amazing! The issue would have been a perfect 10/10 it was just so much fun to read! Comic Reviews: Detective Comics #970, Mister Miracle #5, Runaways #4 and Unbeatable Squirrel Girl #27. The Fall of the Batmen continues unabated and I hope Tynion hasn’t bitten off more than he can chew on this one! Lots of moving pieces. Since he’s come back, Red Robin has been working on overdrive to implement all the new ideas he has for crime-fighting in Gotham City. He wants to rope in more of the Bat-Family and fully supplant the police department — which has made a lot of very important people very upset, according to Jacob Kane. There are government people who have been waiting for Batman to cross a line, and many fear this is it. Meanwhile, Batman and the others are investigating some footage taken of the Belfry Team that the bad guys are using to study their moves (and program said moves into robo-ninjas). 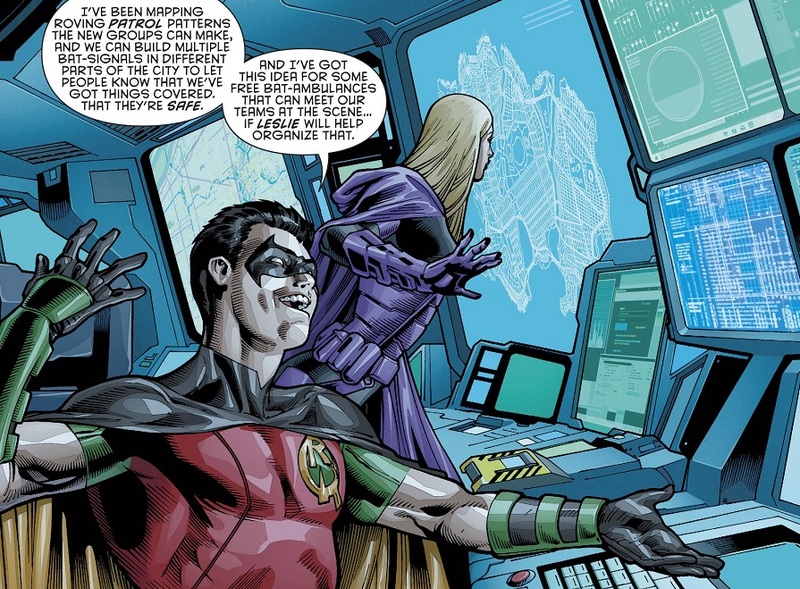 When Red Robin is tasked with tracking down the footage, he discovers that it was all taken with Stephanie Brown’s cell phone! He confronts her with this betrayal and Stephanie is obviously pissed that it would be his first assumption, especially when she proves that it was Anarky who used her phone to take the footage. Steph goes off to confront Anarky alone, leaving Tim to stew in the Belfry. Meanwhile, the procedure that should turn Clayface human again is almost ready, but the doctor would like to be able to do a test run. Clayface suggests the mud lady from the Victim Syndicate and he goes to Arkham Asylum to talk to her — but she and the Syndicate ambush Clayface! This issue was a little over-stuffed for my tastes, a little too wordy. Tynion has a ton of plates spinning and not all of them jive together as well as we’d hope. He’s already got a ton of characters in this book, and in this issue, most of them are separated and off doing their own thing, with the stories only tangentially connected. Most of the individual stories and scenes are good and enjoyable. This is still a very well-made comic. I have faith that Tynion is building to something good, but he’s taking the long, exhausting road to get there. 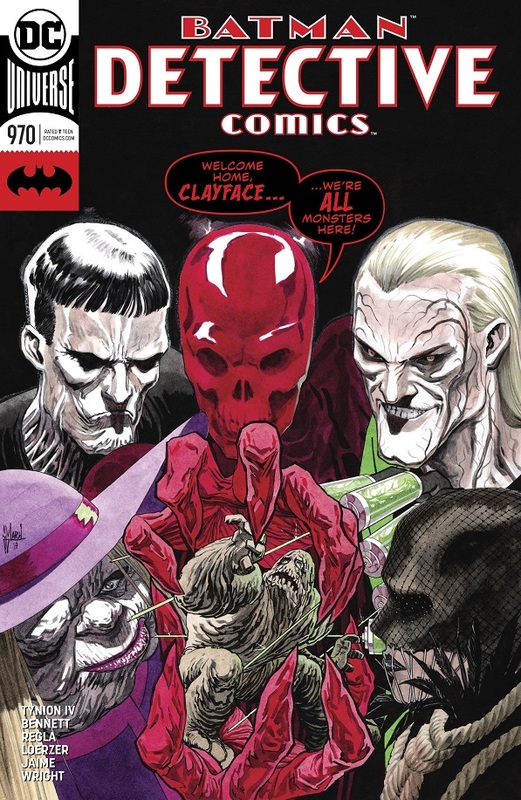 This is also the first issue of the series that made me realize just how expansive the Bat-Family has become, and how that kind of detracts away from the core idea of Batman and Robin. I love me some Tim Drake, but man, there are a lot of Bat characters in Gotham City. And Tim’s plan is really reaching. If only the Evil Future Fascist Batman had actually told Tim how the future was dark, this all could be avoided. TL;DR: The latest Detective Comics story is building to something big, but this individual issue is a bit over-stuffed with characters, dialogue and separate storylines to keep things flowing smoothly. Man, I can’t wait for the other shoe to drop on this book. Whatever King and Gerads are building here, it’s awesome…but I feel like there’s an entire bonus level of awesome that we just haven’t been exposed to yet. Mister Miracle has been sentenced to death and he’s willing to accept that, but he tells his wife that if she tells him to “stay”, then he won’t surrender, he’ll kill Orion and he’ll go to freakin’ war. But she tells him that she can’t make the decision for him. She can’t be his way out of this. So instead, the two of them spend one last day together enjoying the sights and sounds of both each other and Los Angeles. They visit an old friend’s tombstone, they enjoy a last meal, they sit around and watch the stars while Scott ruminates on the old phrase, “I think, therefore I am”, plus a bunch of more stuff about the nature of God. They make love a couple times. Funky Flashman, the new PR guy for the New Gods, tells Scott that Scott is going to tell the world that he’s committing suicide because he never really escaped death. That’s going to come off better than the most popular New God getting executed. Also, for reasons that I hope will become clear eventually, the whole comic is presented normally, but every once and awhile, a panel or two will get fuzzy, as if something has happened to the TV reception like from old TVs. The creative team has used this throughout the series so far. This issue was nice. Though, as with every issue of Mister Miracle, I’m a little afraid that I’m missing something super important. 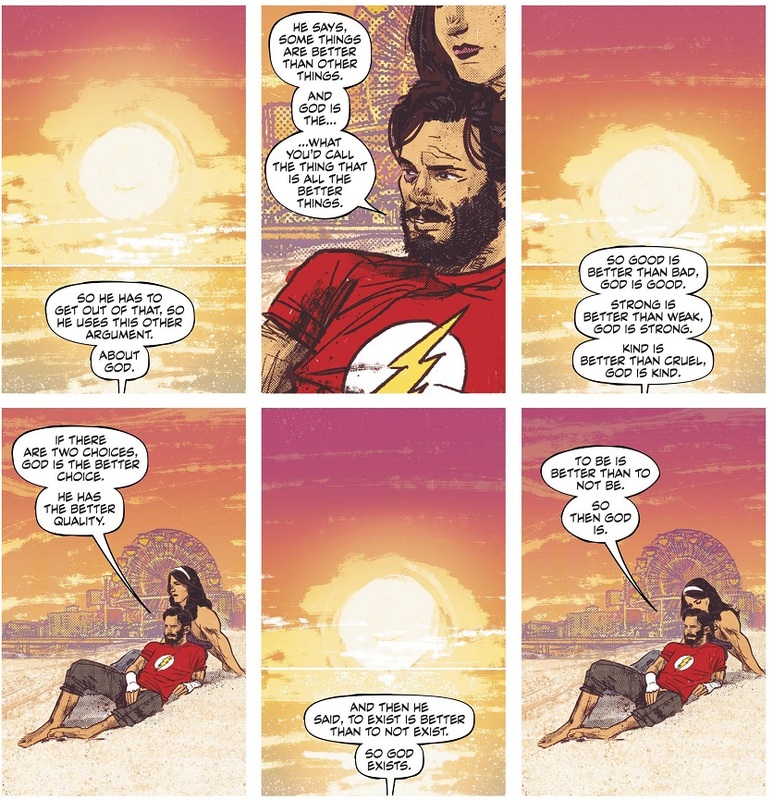 On the one hand, the most obvious hand, it’s a great story about Scott and Barda spending one great, glorious day together before his execution. It’s a little weird that he’s being executed, but such are the New Gods, and that weirdness only heightens the story. They have a really nice day together. It’s very intimate and very personal. 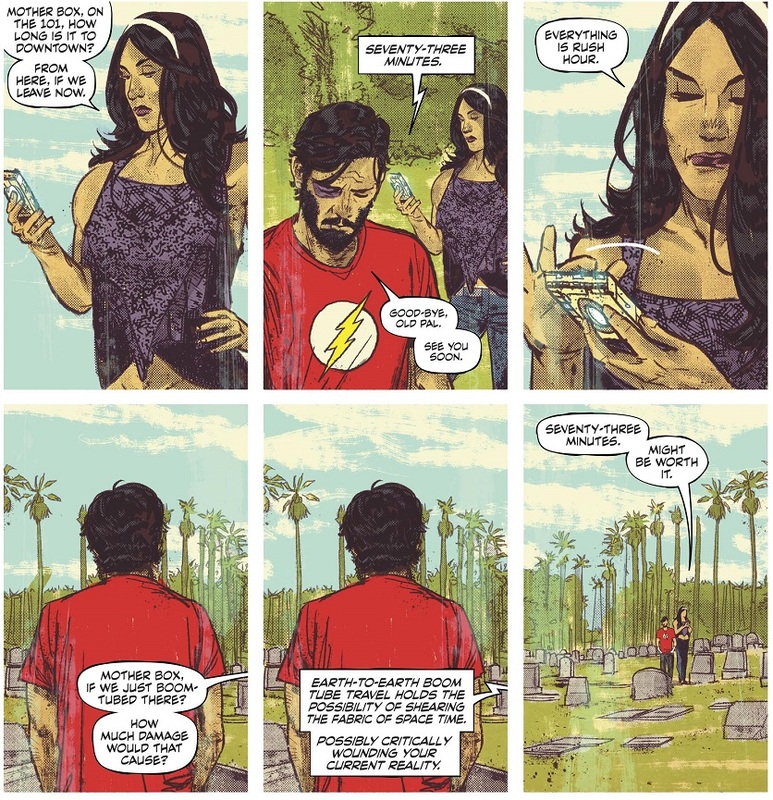 There’s some more of the weird Mister Miracle philosophy on God thrown in for good measure. Then everything comes together so awesomely in the end when Big Barda stands tall and tells her husband to fight this lunacy. The issue comes full circle, from Barda telling Scott she can’t do that for him in the opening pages, to her standing up and doing it for him in the conclusion. It’s great…on the surface. But I’m still so worried that there’s much more below the surface of Mister Miracle! What’s with the weird television-style disruptions? Is any of this real? Is Barda being controlled by Darkseid? What the heck is going on?! Also, there’s probably something very meta about Scott putting his hands in Jack Kirby’s cemented handprints outside Grauman’s Chinese Theatre, only for Funky Flashman to show up immediately (Flashman being a DC Comics stand-in for 70s-era Stan Lee). 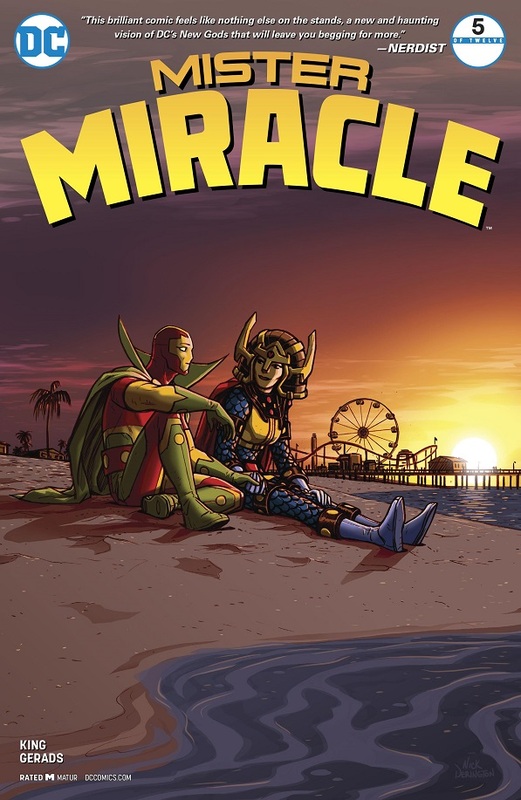 TL;DR: The new issue tells a wonderful, intimate story about Mister Miracle and Big Barda, but I can never shake the feeling that something deeper and more dangerous is going on. I’m still very much loving this new take on the Runaways. I also need to start watching the TV show. I hear it’s really good! Chase, Gert, Nico and Victor’s head arrive at Molly’s house, where she’s been living with her grandmother. Molly is super happy to see them all, and the grandmother welcomes them inside, since Molly has told her all about them. Molly takes her friends on a tour, but when Gert insists she start packing because they’re taking her away, Molly says she doesn’t want to leave her grandmother’s place. Gert is once again bummed out, but a chat with grandma convinces Gert to ease up, and she says she’s going to stay with Molly and her grandma for a bit. Also, the grandma is the one with the evil cats that has been spying on the Runaways! I think. She definitely has the evil cats. And Victor’s head is awake, but he doesn’t want anybody else to know. Molly figures it out because she’s awesome, but he makes her promise not to tell anyone. Victor is still trying to figure things out for himself. Honestly, I wish there weren’t any spooky, possibly evil cats or grandmothers in this comic. I wish Rowell really bucked the system and didn’t write a legit superhero adventure. I am loving her exploration of the older, more mature Runaways too damn much! I just want that to be the story! I want Molly’s grandmother to be totally on the level. 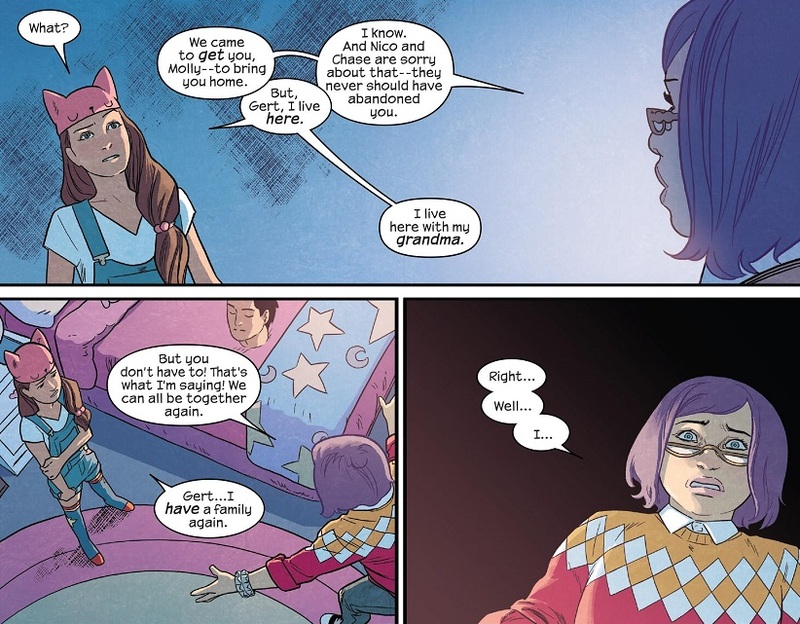 I want Gert to find some peace in Molly’s home and come to terms with the weirdness of her life. The idea of taking Molly away from this home just so they can all play ‘Runaways’ again sounds insane — and that’s exactly what I am loving about this comic! The whole idea is crazy, and in a real, mature world, that sort of crazy just doesn’t fly. It’s a genius concept for a Runaways relaunch. This issue in particular wasn’t as jam-packed with that emotional stuff as previous issues, but it’s still a lot of fun. It’s nice seeing Molly in a happy, loving environment, and then seeing her friends react to the new her. She’s grown up, which is what happens to little kids. And they’ve all got to deal with that. Watching them do so is a real treat in comic form! I realize that, at some point, there need to be superhero shenanigans. But I really don’t need them. I would love a comic just watching these young people adjust to growing up, growing older and finding their legit place in the world. Seeing them all back together like classic Runaways would be such a regression! 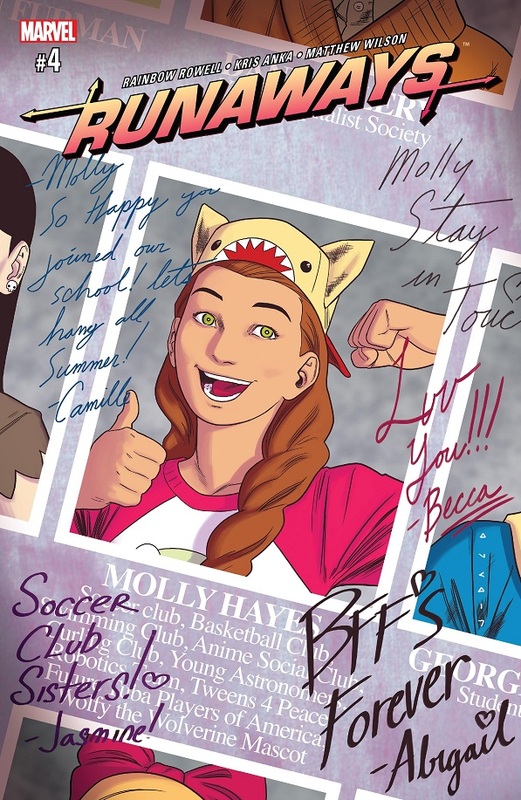 TL;DR: Molly gets the maturation treatment at the heart of this new Runaways, and it’s still just as good! Rowell and her team have struck gold with his new exploration of these popular characters. Much better than if she’s gone back to basics with the comic. Who loves Squirrel Girl? I love Squirrel Girl! And here is definitely more to love! Nancy and Tippy Toe find it really odd that everybody, from Doreen to their teachers to strangers on the street, really want to know the secret of how Squirrel Girl defeated Galactus on the moon that one time. Why is everybody suddenly so obsessed? Turns out, the two of them have been kidnapped by the squirrel aliens of the planet Chitt-crrt! Galactus is about to eat their planet so they teleported Tippy Toe across the universe to find out how to stop the Devourer of Worlds (Nancy coming along was an accident). Once our heroes find out the truth, Tippy Toe reveals that the secret to defeating Galactus was simply befriending him. No big deal. Also, when we meet the buff, overly surfer-dude version of the Silver Surfer that the citizens of Chitt-crrt are dealing with, it appears that the Galactus threat might not be all that it seems. It’s not like the Surfer to leave a bomb on the planet in advance and demand they turn over all their gold and jewels within three days. 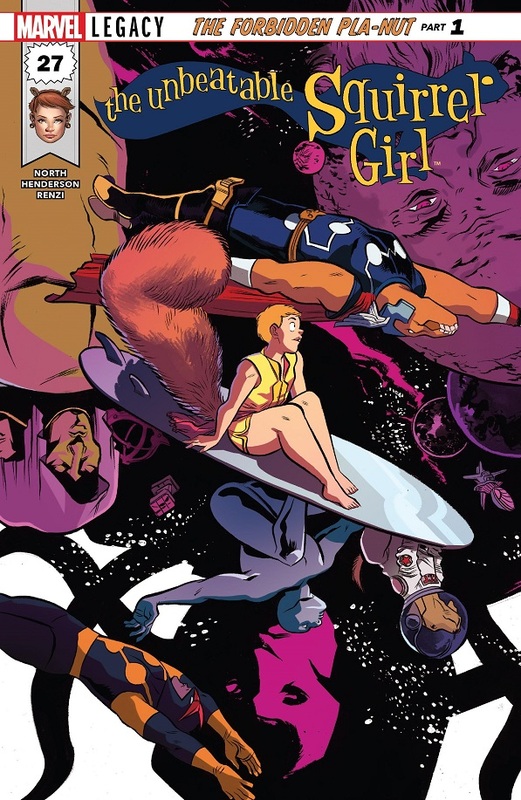 Meanwhile, back on Earth, Squirrel Girl is trying to find out what happened to her missing friends. The only witness to their disappearance was Nancy’s cat Mew, so Squirrel Girl goes around to all her cat-themed superhero friends to ask if any of them can talk to cats — but they can’t. One of them suggests she talk to Dr. Strange for some magical help, but when Squirrel Girl arrives at the Sanctum Sanctorum, she discovers that Loki has been crowned the new Sorcerer Supreme! He’s more than happy to help find the great Nancy Whitehead with a locating spell, and Squirrel Girl is ready to be teleported across the cosmos to go save her, but then the Dread Dormammu comes for them both! Man, this comic can be silly in so many amazing ways! I love it! At first, I thought the issue was going to be some kind of clip show, flashing back to that classic, awesome Squirrel Girl vs. Galactus issue. But then the revelation that it’s a weird alien hologram program? Awesome! And then the in-depth explanation about how this squirrel and nut-based planet has the power for only one cross-galactic teleportation was hilarious! I was a little dismayed that the squirrel planet isn’t really dealing with Galactus, but I suppose our heroes could save the day just by reminding Galactus that they’re all pals. So this new threat of the bro-tastic Silver Surfer should be good. And North writes a great Loki, so that’s a welcome guest appearance! Loki with an ever-growing cat head is an all-time comedy classic! North and Henderson deliver some solid new Loki humor in this issue, too! But if I’m being completely honest…eh. I’m not really down with Loki as the new Sorcerer Supreme. It reeks of editorial mandate of the highest order. Like, maybe if the new writer of the Doctor Strange comic wanted to do it for their story, I could understand. But should Squirrel Girl really be the place where the new Sorcerer Supreme takes on Dormammu? For that matter, and most importantly, what about Jason Aaron’s plans for Loki in his Mighty Thor epic? Loki is kind of a big part of the War of Realms, and having him off on Earth playing temporary Sorcerer Supreme seems like a dumb way to progress that story. Loki has better things to do! Great use of him in Unbeatable Squirrel Girl, though. 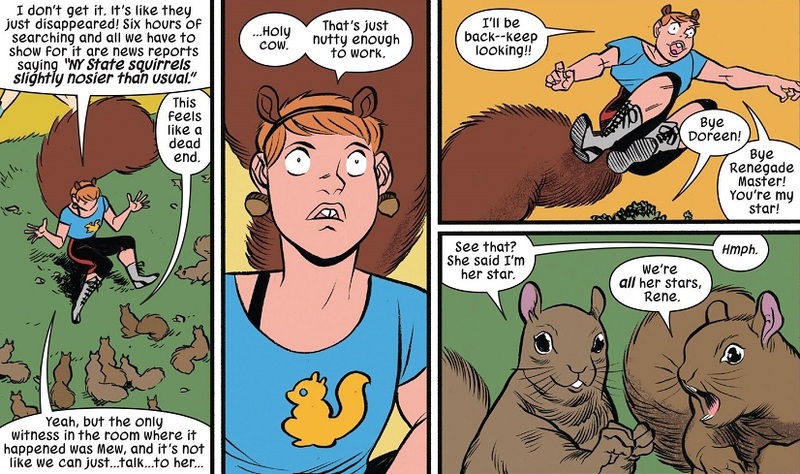 TL;DR: Unbeatable Squirrel Girl embarks on another super fun, super silly storyline. That’s exactly why we have this comic and why I love it so. Posted on December 16, 2017, in Comics, DC, Marvel, Reviews and tagged Detective Comics, Mister Miracle, Runaways, Squirrel Girl, Unbeatable Squirrel Girl. Bookmark the permalink. 2 Comments. Runaways is good. Interesting how this opening arc is basically all about how the entire idea of a new Runaways series is. Squirrel Girl is wonderful, as usual, just ridiculous and fun and great. Hawkeye was indeed delightful last week. So great. I’m loving that about Runaways. Like, it would have been so easy to just get the team back together and go back to basics. But instead, I’m loving the reflective take on the series with everyone acknowledging that they’ve grown up and moved on.